What Happens in the Cold End? Are there downsides to Direct-Drive? What Happens in the Hot End? The most popular 3D printers on the market use a technology known as Fused Filament Fabrication (FFF). This 3D printing technology works by feeding a thread of plastic filament into a heated metal block that melts and extrudes it a predetermined speed through a nozzle. This process is repeated layer upon layer until a three-dimensional print is created. There are several different configurations and mechanisms that take the filament from the spool to the hot end of the extruder. In this article, I’ll discuss the main components of the extruder and the different types used in most 3D printers. I’ll also delve into the advantages and disadvantages of each type. Finally, in the last part of this article, I’ll show you which are the best direct drive printers on the market. The extruder is one of the critical parts of a 3D printer as it handles the entire process of moving and heating the filament material. You can think of the extruder as being two separate elements; the cold end and the hot end. The cold end handles the motion of the filament before it is heated. The layout and the position of the cold end of the printer determine whether it’s a direct drive or Bowden extruder. Generally, the cold end is made up of an extruder motor and gearing which are either mounted on the printers frame or the print head. There may also be PTFE tubing that directs the filament material into the hot end. The arrangement of the extruder and the PTFE tubing depends on the style of the extruder. The cold end consists of a stepper motor that turns a toothed gear. On the same shaft is a hobbed gear which grips the filament and pulls it from the filament spool as it rotates. A spring idler maintains pressure on the filament, pushing it against the hobbed gear. These parts and mechanism make up both direct and Bowden style extruders, except in a Bowden extruder PTFE tubing guides the filament after it exits the hobbed gear towards the hot end. In a direct-drive extruder, there is no distance between the cold end and hot end, and so no guide tube is needed. In most FDM 3D printers, a stepper motor is used to initiate the motion and extrusion of the filament. The stepper motors are brushless DC motors that achieve a high level of accuracy in small movements and attain full torque at low speed. A common problem seen on 3D printers is the filament slipping between the gears that push it to the hot end. To try and fix this, several different configurations of hobbed gears and sprung mechanisms are available. One good example of this is the Bondtech extruder which uses two counter-rotating hobbed gears to grip the filament on both sides. As a result, there is a significant increase in friction to grip when extruding the filament. Now you know the basics of the extruder mechanism we will look at the differences between direct drive and Bowden extruders. You can easily recognize a direct drive extruder because it has the extruder motor placed directly above the hot end. The key feature of the direct-drive arrangement is that it reduces the distance the filament has to travel and therefore the speed and quantity of filament the hot end receives is identical to that which was extruded. This is because the filament can’t flex or otherwise deviate away from its straight path. You can visualize this difference by gripping a piece of uncooked spaghetti between your finger and thumb. If you then try to push the spaghetti through your fingers by pressing it on the end furthest from your grip, it will just bend. If you then do the same but push it closer to where you are gripping it, it will bend much less, and you will be able to push it through your finger grip. Because the hot end always receives precisely the extruded amount and speed of filament, printing is more accurate and more reliable. Because there is no chance for the filament to bend or deviate between the extruder and the hot end, this means you can print with filaments that would be too flexible to use on Bowden setups. So direct drive extruders and perfect for flexible filaments like TPU. Another significant advantage of this type of arrangement is the ability to finely control filament retraction. The placement of the motors on top of the hot end reduces the travel distance so the filament can easily be pulled back by the extruder motor. At this point, it sounds like direct drive extruders are the answers to all our 3D printing prayers! However, as you might have suspected there are some disadvantages to direct drive. The first disadvantage is that a 3D printer with a direct extruder must have a bulkier, taller, and most significantly, heavier print head because of the extruder motor and mechanism being attached to it. More accurate extrusion – The placement of the extruder directly above the print head helps to easily push the printing material into the print head with no deviation. Faster retraction – A direct extruder can quickly retract filament since the extruder is close to the nozzle. Energy efficient motors – The motors require less torque to push the filament into the print head because the extruder is close to the nozzle and experiences less friction. Compatibility – One of the most significant benefits is that a direct extruder is compatible with a wide variety of printing materials. Burdens motion of the print head – The mounting of the extruder on the print head increases the weight which causes constraints on speed and change of direction. Now you know how a direct-drive extruder works, the difference between direct drive and Bowden extruder is easy to imagine. Instead of being mounted directly on top of the hot end, the extruder cold end stepper motor and gearing is attached to the printer’s frame with a PTFE tubing directing the filament from the extruder cold end to the hot end. The main advantage of this type of arrangement over the direct drive is the reduced mass on the print head which allows it to move, accelerate, and change direction faster. Nevertheless, both the Bowden 3D and the direct drive extruders mechanically work the same. There is still a stepper motor driving the hobbed gear, which bites the filament that passes through it. Removing the weight of the extruder from the print head helps to increase the printing speed. At the same time, it has its disadvantages. For instance, the filament has a long travel distance from the extruder to the print head. This may cause the filament to bend slightly. Things can get messy if you don’t make the correct retraction settings. Another major issue with Bowden extruders is friction. Since there is a distance between the extruder and the hot end, there should be adequate torque and bite to push the filament inside the tube. High speed – Since the extruder is mounted on the printer’s frame instead of the print head, there is less mass on the carriage. As a result, the printer can print at a higher speed and with greater accuracy. Large build volume – Purely because there is less to package on the print head, build volume can be slightly larger on a Bowden setup. Limited materials – Bowden extruder is limited to certain types of filaments. Flexible and abrasive filaments tend to get stuck in the PTFE guide tubes. Larger extruder motor – Because more force is required, larger and more expensive extruder motors are required. As highlighted above, the motion of the filament happens at the cold end. The melting of the filament to create the 3D prints happens at the hot end. Inside the hot end, the filament transforms from solid to liquid. Even though the process may seem simple, there are several processes involved until the filament is extruded to the build plate. The hot end consists of a sequence of parts that work harmoniously to extrude the liquid filament. First, there is a filament feed tube that is featured in both direct drive and Bowden extruders. It runs from the cold end to the hot end. However, not all direct drive extruders feature the filament feed tube. In fact, in some direct drive extruders, the filament runs directly into the print head. In Bowden extruders, the feed tube directs the filament into the hot break via the heat sink. The heat break, in this case, is a threaded non-heat conducting metal tube. It is divided into two parts-one part for the heat sink and the other for the heater block. The interior surface of the heat break is treated to reduce its friction and allow the filament to pass freely through the nozzle. The management of heat at the hot end is critical. This is because of the high temperatures involved and how a small change it temperature can affect the viscosity and flow rate of the filament and therefore impact on print quality. The combination of the heat break and heat sink ensures that the filament is melted with exactly the right temperature. If you’ve decided that you’d like to take advantage of all the benefits that direct drive extruders offer then you’ll need to decide which 3D printer to buy which features a direct drive. Next up I’ll show you a list of 3D printers that have a direct drive extruder, and I’ll point out their key specs, and pros and cons to help you decide which will be best for you. The Monoprice Maker Select Plus is a small Cartesian style 3D printer that features a direct-drive print head moving on the X and Z axes. The Maker Select shares many features with the Wanhao i3 Plus and the Anycubic i3 Mega. The control box is integrated beneath the print bed which helps to minimize the footprint of the printer. This means that you can use the printer even on a limited workspace. The Monoprice Maker Select Plus also has a touchscreen interface placed at the front of the printer. There is a USB connection that helps to print even when your computer is offline or in a different room. Because of its open design, the Maker Select is not ideal for printing ABS, but the direct drive extruder does allow you to print using a wide range of other materials including flexible filaments like TPU. The Creator Pro is a mid-budget dual extruder 3D printer that is worth every cent of its moderate price tag. 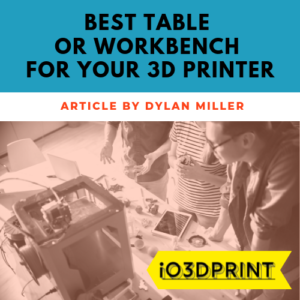 Because of its reliability and longevity, it has grown a dedicated following of supporters who consider it to be a workhorse of a 3D printer. Since the Creator Pro is built on an open source platform, it can be easily tinkered with and upgraded to further improve its performance. It features a new build platform system that offers more stability during vertical movement. There is also the full metal platform that can endure high temperatures at the print bed. The frame is also sturdy enough for durability and to reduce wobbling during printing. On top of the durable construction, the FlashForge Creator pro comes with a powder-coated steel frame backbone that holds the motion mechanisms involved in the printing process. This makes the printer more stable, faster and precise. Since it is a closed unit, it lacks a generous build volume as featured in the open frame models. However, the casing ensures that the consistent temperatures are maintained at all times so it is very capable of printing temperature sensitive materials like ABS. It is shipped fully assembled which eliminates the tedious setup process. Furthermore, the front door opens to almost 180o making it easy to remove your completed prints. At under $1000, the QIDI X-Pro is one of the best affordable 3D printers on the market today. It features an enclosed design for safety and to create a controlled temperature environment, but you can still view the printing process through the large clear door. The machine has a premium look due to its plastic and metal construction. Apart from the stylish design, the printer is shipped almost fully-assembled – you only need to carry out a small set-up. One of the most notable features is the dual extrusion capability that allows you to try multi-colored and multi-material models. The X-Pro has a heated aluminum build plate which prevents prints from sticking to the bed and aids the printability of many different materials like nylon and ABS. The build volume is a little more generous than the Creator Pro at 225 x 145 x 150mm. Furthermore, the build plate can be removed so you can easily unstick your completed print from the bed. You will just need to slightly bend the bed and the 3D model will peel off. The MK3 is the highly anticipated latest model of the respected Prusa i3 series. It features several upgrades and innovations including a Bondtech extruder drive gears and an E3D V6 nozzle. The MK3 is one of a kind 3D printer boasting a package of smart features that make the printing process flawless and easy. Under $1000, this 3D printer is suitable for all kinds of applications by novices, hobbyists and professionals alike. The Original Prusa i3 is available in two main packages; a DIY kit package and pre-assembled package. The kit is very well documented so assembly is not difficult, however, you should set aside a whole day to carry out the assembly. Assembling the kit is useful as it gives you an appreciation and understanding of exactly how the printer works, making it much easier to diagnose future problems. One of the most notable features of the MK3 is the optical filament encoder in the filament sensor. It helps to provide early warning when the filament is about to run out. The printer can pause the printing process and prompt the user to load another filament. It can also detect when the filament is stuck and recommend cleaning of the nozzle. Thanks to the heavily upgraded motherboard with Trinamic2130 drivers, the Prusa i3 MK3 has by far the fastest max printing speed on this list, at 200mm/s! 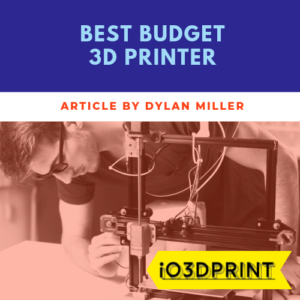 When looking for a 3D printer, most people consider factors such as ease of setup and use, print quality, reliability, build volume, connectivity, price and more. 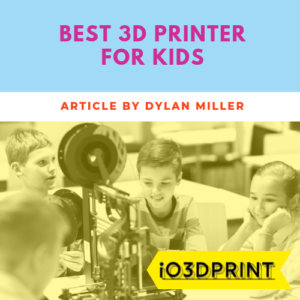 Even though there is no printer that can good in everything, the Digilab 3D35 printer comes close and has a very impressive list of features that make it stand out from its competitors. The high price is compensated with ease setup, high-quality prints, reliability, and consistency. It features a closed frame with two plastic doors on the front and top of the printer that open outwards for easy access to the printing chamber. The plastic door and the lid are completely see-through to view the printing process. The Digilab 3D45 provides a generous build volume of 254 x 152 x 170mm that is ideal for most applications. On top of that, the printer has a 5-inch touch screen which is easy to navigate and understand. One downside of the 3D45 is that only Dremel’s own filament is officially supported. The 3D45 is, however, perfectly capable of printing using third party materials. Initially, Dremel offered only a limited color range for the filament. However, the company has now introduced over ten color choices for its filament at affordable prices. Also, loading the filament is easy and straightforward. This printer offers a variety of connections for printing. You can print from the computer, USB thumb drive, and Ethernet or Wi-Fi connection. 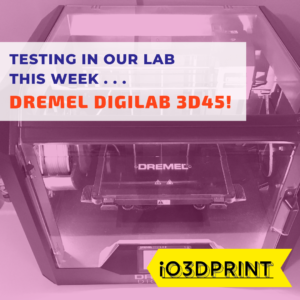 The 3D45 does also have a printing app, you can connect it with the Dremel Print Cloud where you can slice files, send prints straight to the printer wirelessly, and even monitor the printing progress using the built-in HD camera. A the end of every build, a short time-lapse video of the entire print is automatically made available for viewing and download. Sindoh is a South Korean 3D printer manufacturer that has made a big name for itself in the 3D printer community due to its high quality and easy to use printers. The 3DWOX 2X is one of their signature products featuring dual extrusion capability and a hefty list of features which can only be compared to high range printers. One of the most noticeable features is the independent dual extruder (IDEX) which allows the user to print different colors, materials or two objects simultaneously. Another major feature is the two-auto-loading cartridges which eliminate the need for manual filament feeding. In addition, this printer automatically regulates its temperatures settings depending on the printing material used. The touchscreen is responsive and simple to operate. This helps to choose the settings and check on the progress of the printing process. Also, the printer makes use of the Alexa Voice Control to command your printer even from a distance. Furthermore, if you want to check the progress of the printing process to ensure everything is going ok, the printer is equipped with a camera inside. This is not common in most printers on the market. Even though the camera does not have the highest quality, it is a convenient way to monitor your project. There are many good reasons to take advantage of the benefits of a 3D printer equipped with a direct-drive filament, If you are interested in printing flexible filaments or are simply looking for the most accurate or speedy printing then direct-drive extruders will help you. It’s no surprise that many of the best 3D printers available use direct drive technology for their extruders. I hope this article helps your understanding of the technology.